There are three reasons that, when combined almost always make me opt for the Kalapà: 1: I don’t want to cook at home, 2: I’m on a low budget and 3: “Get that pizza out of my face, that’s all I’ve had for the last 2 weeks!”. Since this is the case quite often, correspondingly you will also find me there often. 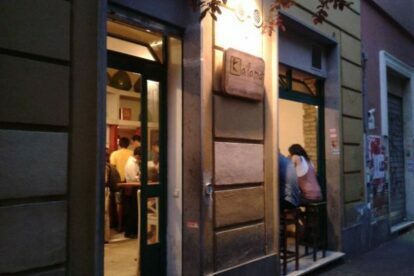 But the reasons to go there don’t just stop there; It’s a nice little cosy place (in fact on busy days/nights be prepared to eat while standing as they only have a few chairs) in one of the most authentic though fashionable neighbourhoods in Rome, the Pigneto. And lastly, but most importantly, the food is just great! The sign in front of the restaurant says “Greek specialities”, and while it is clearly inspired by Greek taverns and they do serve a (magnificent I might add) Gyros alongside Greek beers, their most famous product, the “Kumpir”, is actually Turkish. Now to the Kumpir, Kumpir are large potatoes, wrapped in tinfoil and then baked in a special little oven. Then they get cut open and filled with whatever you dream about at night… tomatoes, feta cheese, mayonnaise, sweet corn, olives, minced meat and the list goes on. There is also a vast choice for vegetarians, and some dishes are even vegan! To get there just take tram number 5, 14 or 19 and get off at the “Prenestina – Officine ATAC” stop. And give me a call, I live just around the corner!